RSS feeds, those stripped-down, content-only feeds published by many sites, have changed the way many of us interact with the internet. Rather than visiting dozens of sites a day to see if there's anything new, RSS readers pull down all the stories into one window and mark the new stuff. However, you might not want to read every story published by the Mac news sites in your reader, and because some sites still choose not to publish the entire story in their feeds, you will find yourself reading at least some stories in a browser anyway. Times aims to change this. Its styling and name prompt us to describe it as a personalised newspaper, and it's actually a pretty apt label. You subscribe to feeds (by punching in a URL and letting the app discover feeds, by picking them up from your bookmarks or by OPML import) and arrange them into pages. You can choose to be notified when new items appear in feeds, or simply flick to Times and browse through the stories you've added. The interface splits each 'page' into three sections, all of which behave slightly differently. Though we'd welcome more flexibility, these layouts work well to differentiate content types. Times will even attempt to pull down the full story from the main site should the feed only contain a summary. It's not perfect. Early releases proved prone to crashing, and it's patchy about feed parsing and persistency - but it's a refreshingly new way to consume the web. 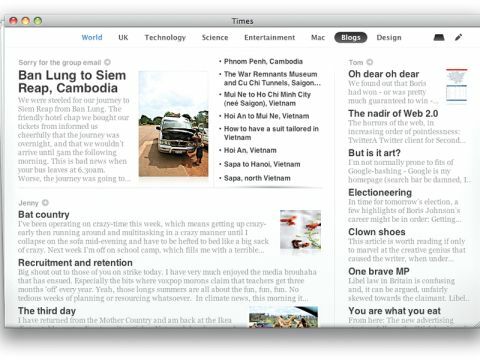 The personalised newspaper approach complements you-must-read-everything RSS readers such as NetNewsWire rather then supplanting them, and while we'll keep using NetNewsWire because of its syncing and iPhone view, Times' coffee-break style will ensure it stays in our Dock.